In January 1957, Luis Marden, a writer and photographer for National Geographic was the first person to discover the exact location of the burnt remains of the HMAV Bounty. Captain Jones and Parkin Christian had, on separate occasions grappled timbers and the rudder to the surface, but the whereabouts of the remains in the rough seas of Bounty Bay was still an unknown. Entitled “I Found the Bones of the Bounty” in the December 1957 edition of National Geographic (Vol. 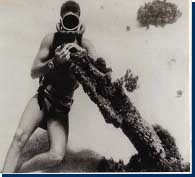 CXII, No 6), Marden’s story outlines how, with local help and self-contained diving apparatus, he estimated the ship’s position from a known group of iron ballast close to the shore and then by searching for unusual limestone-encrusted shapes on the sea floor. With up to 40 feet of turbulent water above, the six-week search was dangerous but fruitful. Along the line of the ship’s keel were found rudder pintles, crescent-shaped oarlocks, bronze sheathing nails, copper sheathing for the hull and later in February 1957, the prized Bounty anchor. The Brigantine Yankee owned by Captain Irving Johnson circumnavigated the globe many times during their “World Cruises” where they took on board paying “helpers” who wanted to seek adventure. Visiting Pitcairn over a period of twenty-three years on seven world voyages, the Yankee called on Pitcairn in February on her final call. The ship anchored on the outer limits of Bounty Bay as the weather was calm and it was by chance that one of her crew spotted the anchor fluke while diving using aqualung apparatus. The fluke is in the Admiralty pattern V-shape that distinguished it from rounded flukes, which came into use from 1810. The location at this site is probably due to the fact that Fletcher Christian dropped a stern anchor then paid out a cable slowly to enter the rocky inlet of Bounty Bay. The twelve-foot anchor would not give up without a fight, however. Captain Johnson manoeuvred the 96 foot long Yankee into position then lowered his own anchor to enable divers to tie cables to both anchors. Using the winch from the Yankee they took the strain but nothing budged. The Captain then pulled from alternate sides until after some time, the anchor rose to see the light of day once more. While the Bounty is thought to have had up to five anchors (two of which were left in Tahiti), this anchor is the most significant and now stands proudly in The Square in Adamstown. “ (The anchor) had been searched for many times, but not in the direction in which it turned out to have been set. There are not many straight lines in Nature except for the very conspicuous horizon. Thus, when one of our crew spotted the fluke of the anchor, though heavily coral encrusted, sticking up in the air from the sea bottom about 50 feet down, it aroused his curiosity and he investigated further. Once above the water, it was laid over one of the Pitcairners’ 37 foot wooden Longboats and carried into shore. We “Yankees” were all excited at the discovery. Once it was hoisted off the bottom and could be seen in its entirety, it became more and more likely that it actually had come from the Bounty. Once on land, the whole island population took a great personal interest in it, looking it over carefully and talking about it. 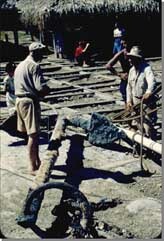 The recovery of the Bounty’s anchor was indeed a highlight of our 18 month voyage around the world. I am a very fortunate person in having been able to make such a memorable voyage”. Format : 4 stamps in a strip with central tab. Full sheets contain two vertical panes of five strips per pane. Paper : 104gsm Chancellor Litho gummed stamp paper. 20 April 2007 for a period of 2 years. The Pitcairn Islands Philatelic Bureau acknowledges the support of Herb Ford, Ted Parker, Victor Nelson, National Geographic magazine and especially Robert Johnson, son of the owners of the Yankee, in making this issue possible.